Welcome back to the second installment of my summer entertaining series! Today it’s all about my absolute favorite part of entertaining — the decor! I always start with a color palette. For this soirée I decided to take my cues from the season and ended up with vibrant greens and warm gold paired with pops of bold black and white. 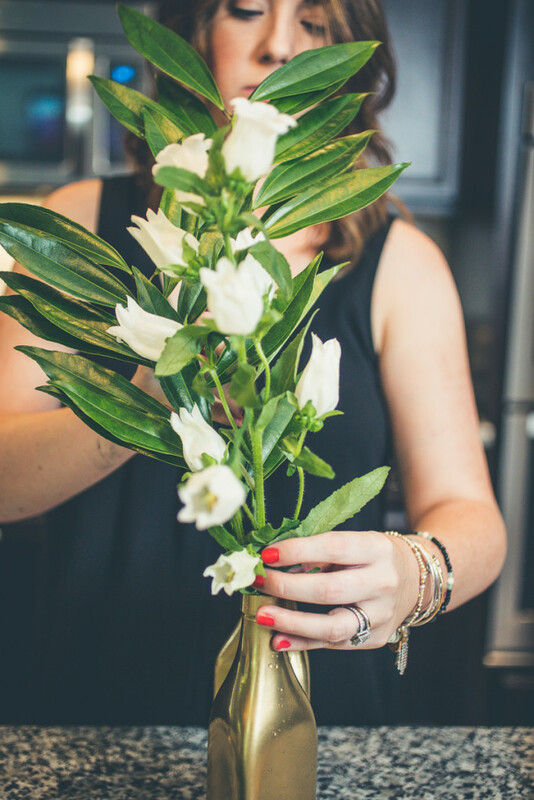 Floral arrangements don’t have to be fancy or fussy. Higher-end grocery stores carry a wonderful variety of fresh flowers these days. When I’m making a special dinner for guests I usually end up needing an ingredient or two from a specialty grocer. While there, I always swing by the floral department to see what interesting blooms they may have in stock. While I was preparing for this dinner I found beautiful white campanula — also known as bellflowers. They look like giant Lily of the Valley and are really striking! Even if you’re not shopping at a higher-end grocery store, you can make a lovely arrangement with supermarket blooms. Stick with one type of flower in a single hue, add some interesting greenery, and place them in a fun vessel to up the style factor. Your vase doesn’t actually have to be a vase at all! Think outside the box when it comes to what to place your flowers in. I have a collection of old bottles which I’ve spray painted over the years that make the perfect vases and they didn’t cost me a thing. I chose some metallic gold to go with my crisp summer color palate, but plain green glass would have looked lovely also! Seating arrangements aren’t just for weddings and huge banquets. Providing your guests with their seats even at the most intimate of dinner parties is a gracious way to accommodate them and keep the party flowing smoothly. No awkward conversations about who will sit where. No need to buy special seating cards. 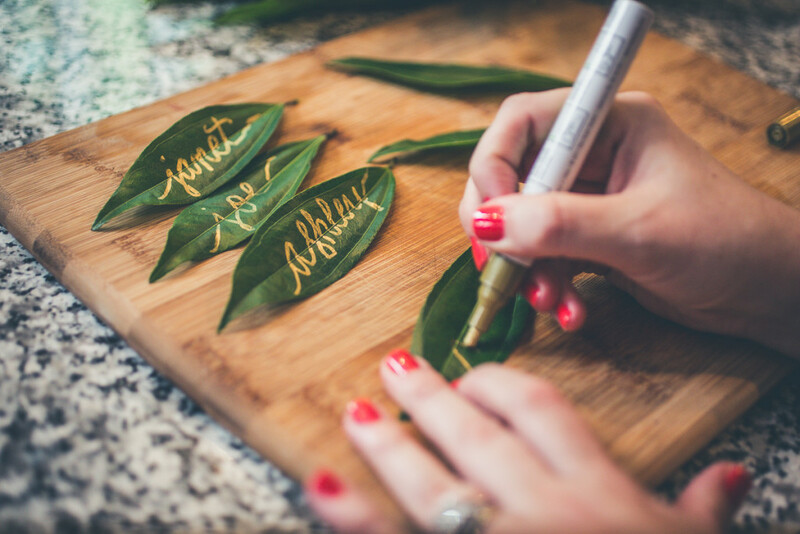 For a chic and easy alternative, simply use some of your extra greenery and a metallic paint pen. 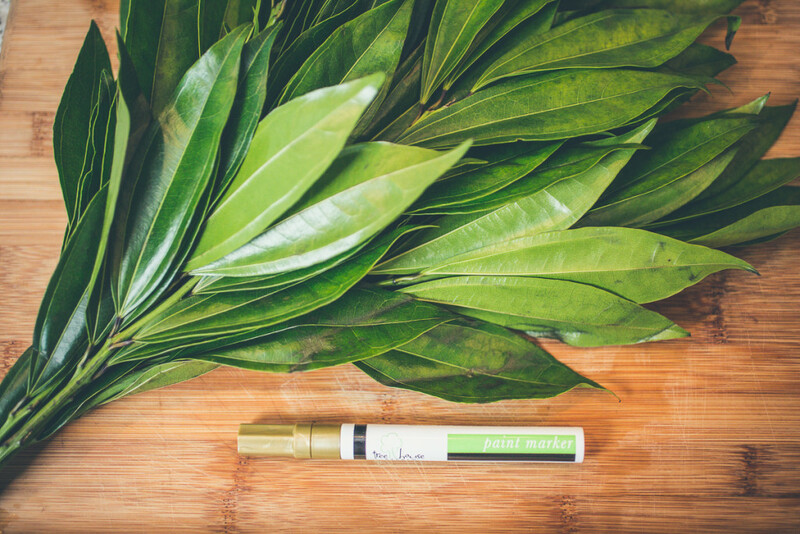 Gold ink on lush green is such a beautiful color combination. 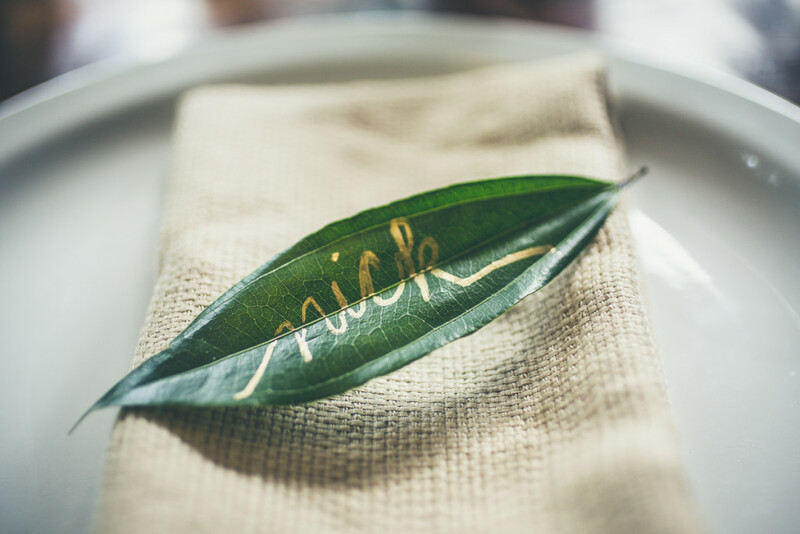 Your guests will notice this little detail, it’s as beautiful as it is functional! And the best part is that it really doesn’t require any additional supplies or much effort at all. 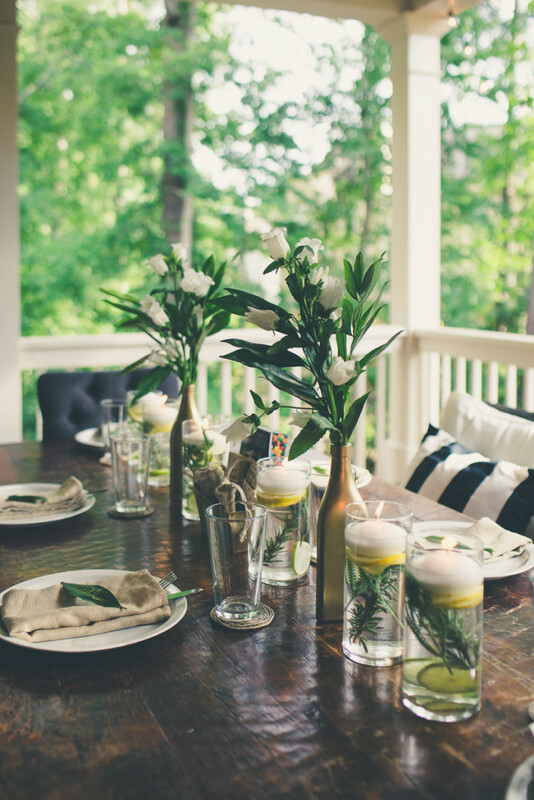 I hope you enjoyed this post on summer decor! There’s more to come in this series starting with some great tips for keeping the party flowing and your guests laughing! For more tips from this series, visit Camp Makery. Ashley is a stylist and an attorney, but most importantly a mother. A lover of all things sparkly, you can usually find at least one speck of glitter within a five-foot radius of her body. 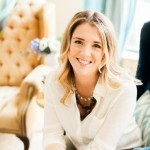 She is passionate about sharing her love of style, crafting, and entertaining.